What can I say about Rats: Night of Terror that hasn’t been said before? Oh wait, here’s something – “I LOVE THIS MOVIE!” Rats is a universally loathed film directed by the universally loathed Bruno Mattei – under his frequent pseudonym (and homage to Dawn of the Dead) Vincent Dawn. Oh did I mention that it was co-written by Claudio Fragasso (aka Drake Floyd) who is best known as the writer/director of the “Best Worst Movie” Troll 2. Needless to say, this film has some real talent behind it. And I still stand by it with every fragment of my being. 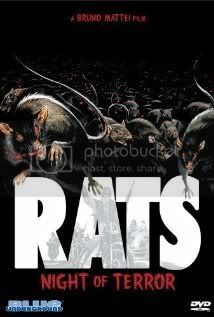 Rats takes place several years in the future after some scientists create a nuclear holocaust. The surviving humans were forced underground to escape radiation, which in turn forced the rat species to go above ground. The rats have since become bloodthirsty killers because of the radiation and after a group of “new primitives” (humans who decided to go above ground and live like scavengers) stumbles upon a mysterious ghost town that has some general needs to maintain their survival, they realize the pesky rats that keep appearing out of nowhere are more of a threat than they could ever imagine! Ok, so I’ll level with you. Rats: Night of Terror is a terrible film with hammy overacting (at least the folks who dubbed the dialogue were overacting), a ridiculous plot and some of the silliest dialogue I’ve ever heard. It had stereotypes (the token African-American character is named Chocolate), an over abundance of animal cruelty and rats that were either fake or painted black, depending on the scene. What I did like about the film is the use of some Italian horror staples, especially Massimo Vanni and Ottaviano Dell’Acqua (best known as the iconic worm-eyed zombie from Lucio Fulci’s Zombie). Also, it had some really cool makeup FX and over the top rat-induced deaths. Oh, and I’d have to say that it has one of the greatest endings in horror history. So if you are looking for a great, well made, scary horror film…DO NOT WATCH THIS! If you are looking for a low budget schlocky Italian horror film to watch with a bunch of friends (and alcohol), Rats: Night of Terror is perfect!